Legal as well as illegal land clearance for agriculture is significant global driver of deforestation. Consumers and retailers are not able to identify the differences between imports of legal, illegal or unsustainable agricultural commodities produced on these lands. Efforts to tackle illegal logging and improve forest governance over the past ten years have included measures aimed at excluding illegal timber from consumer-country markets, including public procurement policy, bilateral agreements introducing licensing systems, and legal and company due diligence requirements. 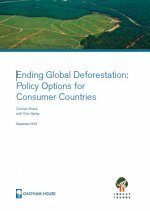 This report considers the feasibility of applying the same kind of consumer-country measures that have been used with effect to exclude illegal timber to agricultural commodity supply chains. Measures considered include public procurement policy, differential tariffs, other government regulations (such as biofuels), bilateral agreements, requirements on companies, due diligence in finance and investment, and working with the private sector.